Happy Wednesday, and welcome to this week's edition of the Gilmore Girls coffee klatch! 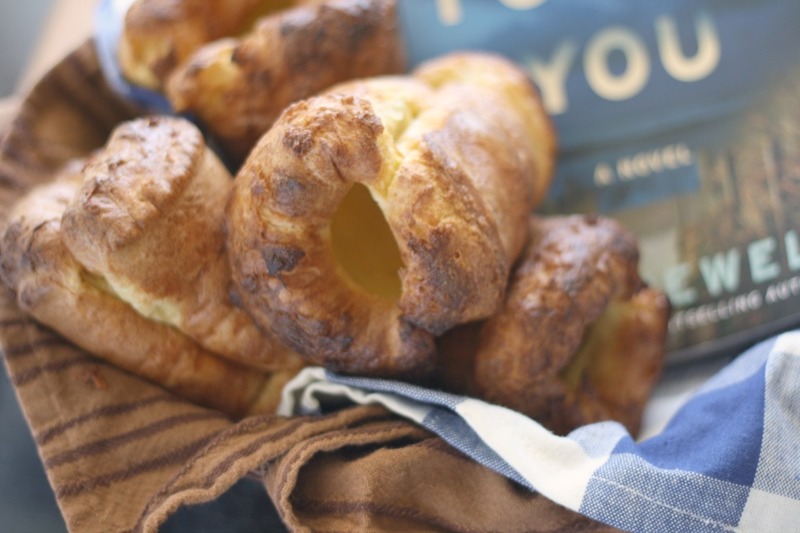 In anticipation of Netflix's Black Friday release date of Gilmore Girls: A Year in the Life, Chef Sarah Elizabeth and I have been binging and the discussing the original seven seasons and sharing recipes inspired by the show for almost 2 months now. Since I binged like a champion, I've been done for a couple of weeks now. So, while I may have shared my thoughts on the series finale last week, my Wednesdays are reserved indefinitely for hanging with the girls. I'll pull ideas from random (and often seasonally appropriate) episodes and share other random Gilmore Girls inspired fun. 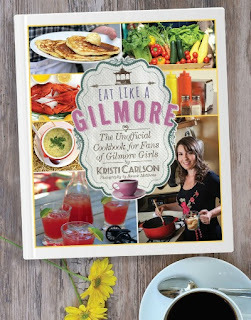 Today I'm featuring a must-have for all GG lovers—the "unofficial cookbook for fans of Gilmore Girls" called Eat Like A Gilmore. 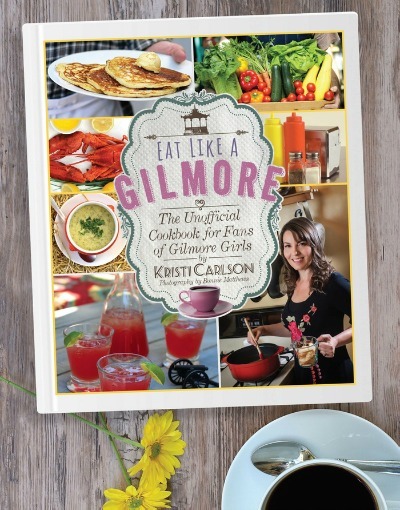 In 2015, author Kristi Carlson, a fan since the original airing of the very first episode in 2000, got tired of waiting around for somebody to write a cookbook dedicated to life in Stars Hollow (and beyond, you know), and did it herself. So yeah, perfect for a girl like me. Which reminds me, a huge thanks to my friend Dorothy (of Shockingly Delicious) who tagged me on another friend's (Nikki of Nik Snacks) facebook status talking about Eat Like a Gilmore. I ordered it on the spot...just like she knew I would. 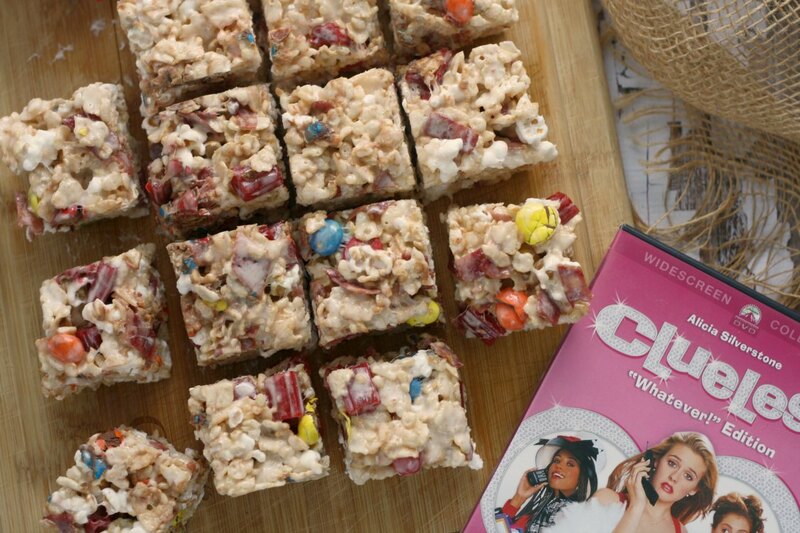 There's all sorts of fun recipes in the book, ranging from some basic coffee drinks (because, duh) to Miss Patty's Founders Day Punch to the Macaroni & Cheese in a Jalapeño-Chipotle Cream Sauce that Sookie tried to serve at a kid's party to Dean's favorite Rocky Road Cookies. 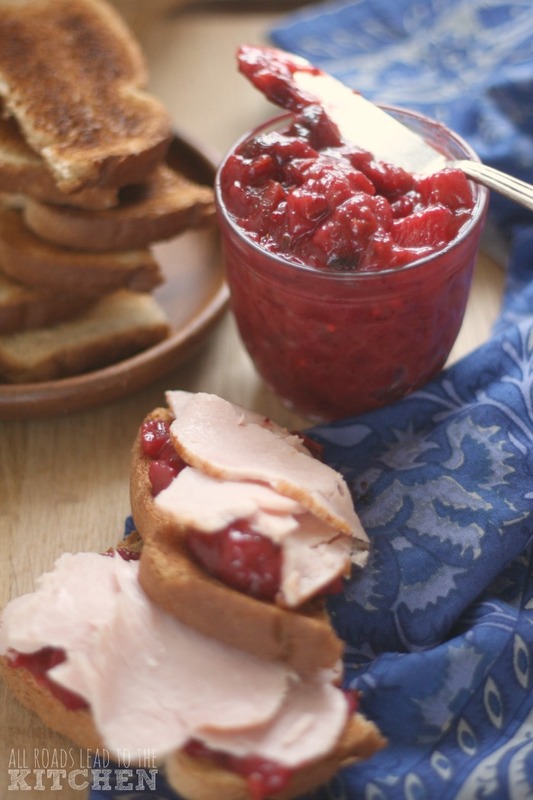 I have a bunch of recipes tagged to try, homemade Beef-A-Roni being at the top, but today I'm sharing this Pineapple Cranberry Chutney, which was inspired by Season 2, Episode 13 "A-Tisket, A-Tasket". It's a yearly tradition in Stars Hollow for the girls to pack a basket with lunch fare to be auctioned off to the menfolk. The winning bidder then gets to eat lunch with the maker of their basket. The baskets are supposed to be anonymous, but never really are. 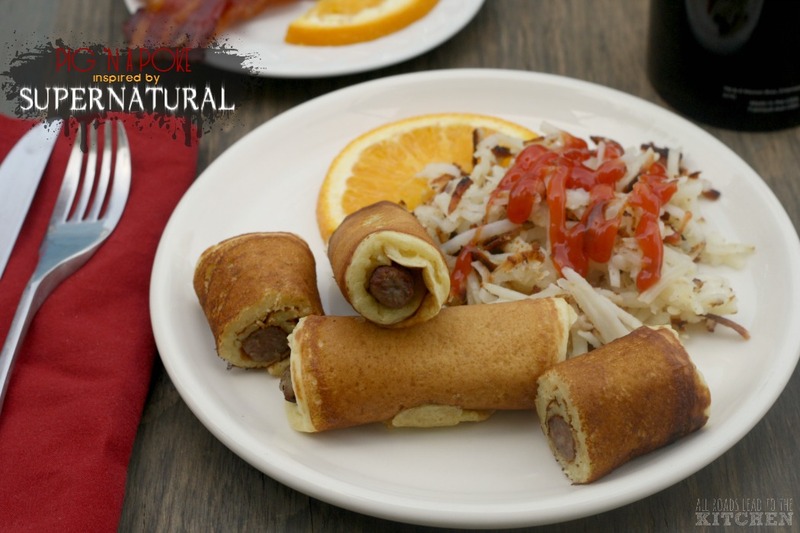 This led to a bidding war between Dean and Jess for Rory's basket (which Jess won - yay! ), Lorelai begging Luke to bid on hers so she wouldn't have to eat with one of the guys Miss Patty was trying to set her up with, and Jackson refusing to bid on Sookie's basket due to an earlier "misunderstanding". Sookie can't believe that Jackson let Kirk buy her basket, but they work through their earlier argument, which leads Jackson to try and purchase the basket from Kirk. Kirk is his usual Kirk-self and basically refuses. Eventually Jackson does get it from him, for a hefty price and a promise of a steady supply of crinkle-cut carrots. While they are negotiating, Kirk is lifting things from the basket and asks Jackson if he had any idea what was in a certain jar. Jackson replies that it's Pineapple Cranberry Chutney, to which Kirk replies "yech". Ummmm, what!? Yum! With Thanksgiving just a week away, I thought not only would it be a delicious time to try the chutney, but also very seasonally appropriate. 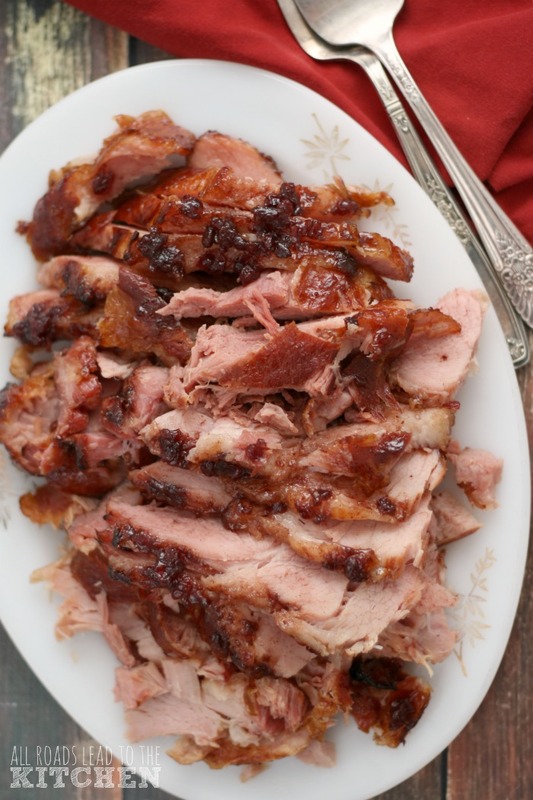 Add it to your Thanksgiving table for a savory and SPICY addition to the meal. 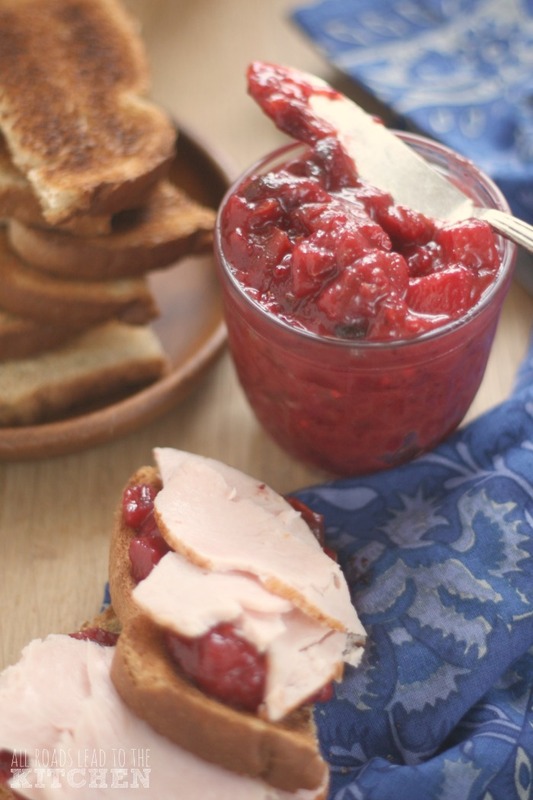 It's an awesome addition to a cheese tray or perfectly at home on a leftover turkey sandwich, as well. fun features: There's all sorts of fun stuff about this book, but I particularly like a couple of things. The Coffee 101 feature in Coffee, Coffee, Coffee!, which is situated just before chapter 1, and talks about the 7 Steps to a Great Cup of Coffee at Home. The way recipes are "classified" throughout the book. Carlson uses symbols/icons to attribute each recipe to its maker: Luke's Diner, Sookie's Kitchen, Emily's House, Lorelai's Asia, Rory Cooks, or Town Favorite.There's even a specialized Recipe Guide located just before the regular index that lists the recipes by icon category...and each recipe is actually "written in a style that suits its maker". 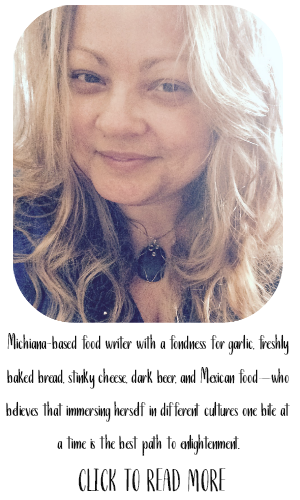 about the author: Kristi Carlson is a longtime fan of Gilmore Girls and has experience as a cook, baker, and caterer. 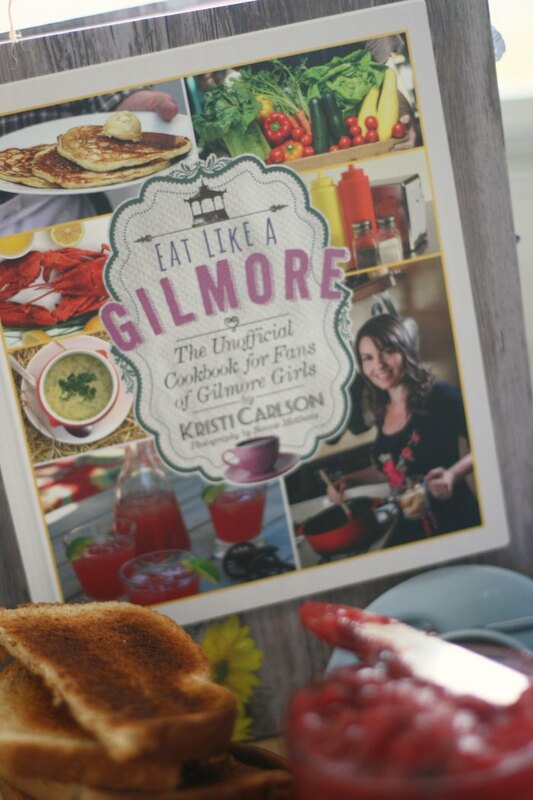 Eat Like a Gilmore joins her two loves together in one book, and she is thrilled to share her passions with fellow fans of the show. She resides in Burbank, California. 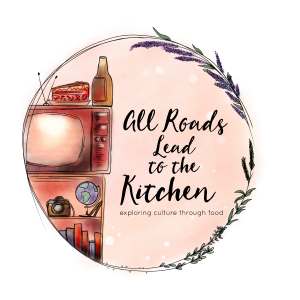 If you enjoyed this post, I hope you'll drop in on my weekly coffee klatch discussions and get more recipes inspired by Gilmore Girls here on All Roads Lead to the Kitchen, and also at Chef Sarah Elizabeth's blog. Copper Boom! 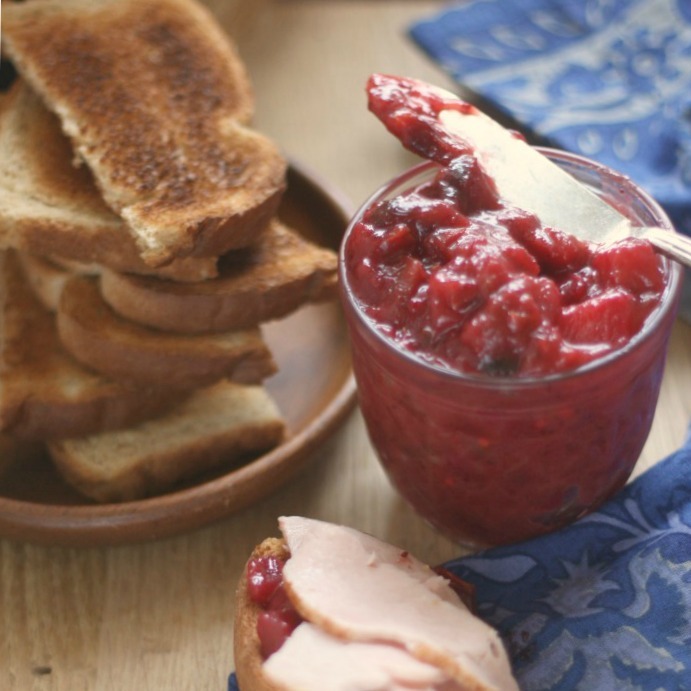 Sweet, savory, spicy, and sour, this chutney is the perfect picnic condiment. Great with soft cheese and crackers or a turkey sandwich. Heat oil in a 4-quart soup pot over medium heat. 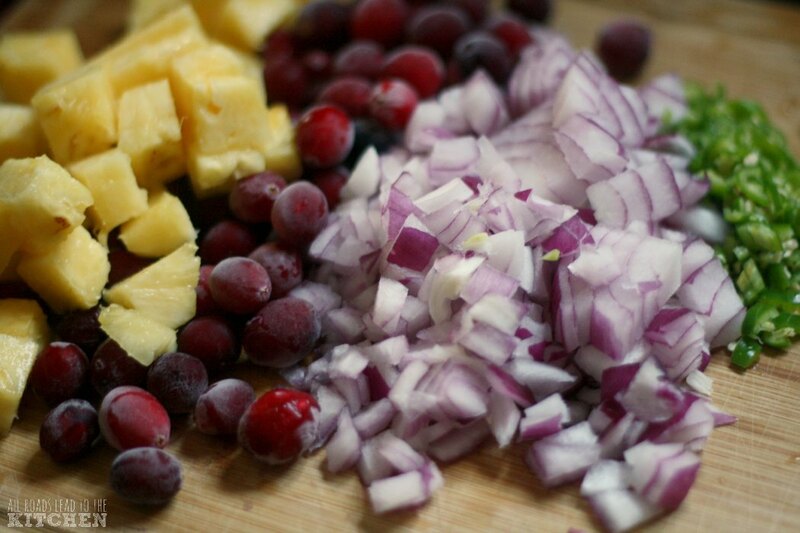 Add cranberries, pineapple, onion, and peppers; stir to coat. Cook, stirring often, until plenty of liquid is released and everything starts to soften, 12-15 minutes. Add remaining ingredients to the pan and stir to combine. Put a lid on the pot and reduce heat to low. Cook for 30 minutes, stirring from time to time, until you have a thick chutney. With soft cheese and crackers. On hearty whole grain bread with thick slices of turkey and baby arugula. Alongside your Thanksgiving or Christmas turkey.